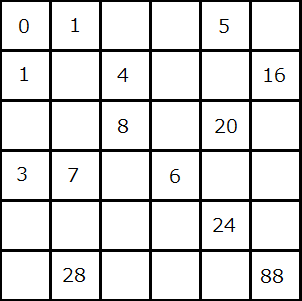 Here is a square filled with numbers and holes. 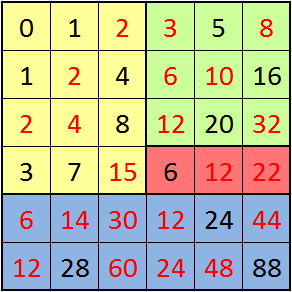 The square is divided in multiple invisible areas which all have their own specific logical sequence. 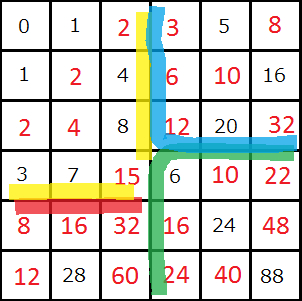 Although every numbers in an area is found with the same logic, the numbers used to find the next number can come from another area. Can you find every positive integers missing by finding out the logical sequences? This is an new experimental puzzle for me, so let me know how it is in the comments. Hopefully it will go well. I used the word "sequence" quite loosely here. The correct solution will be found with a total of 4 areas. The shapes of the areas are quite basic. No weird awkward shapes. Equally divide the square into 4 3x3 quadrants. Top left quadrant - sum of the cell above and to the left. Bottom left - sum of all the cells above. Top right - sum of the cell 2 steps to the left and of the cell to the left. Bottom right- sum of the cell 3 steps to the left and of the cell 3 steps above. The numbers (as we fill the rows) are 0,1,2,3,5,8,1,2,4,6,10,16,2,4,8,12,20,32,3,7,14,6,12,22,6,14,28,12,24,44,12,28,56,24,48,88. Got a lot of help for this from Angzuril and mactro's answers. Green: Sum of cells 3 and 4 to the left. In case there is no cell 4 to the left, it's two times the 3rd cell. My solution, probably not intended solution. Red: Form of $2 \times (a - b^2)$ , where a is 3 cells to the left, and b is 3 cells above a. The complexity of this rule leads me to believe it is not intended.